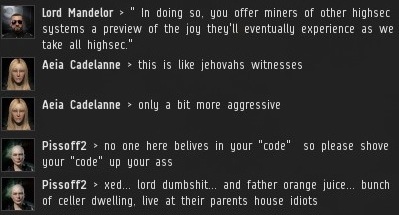 I couldn't reach but a fraction of highsec without the support of my dedicated Agents, who tirelessly spread the Code. Each Agent shares in the sterling reputation that the New Order has built over the last several months. It's easy to become an Agent, as the New Order transcends all corps and alliances. An Agent is anyone who acts in the name of the New Order and enforces the Code as he sees fit. Agent Lord Mandelor sent me a report about Code enforcement conducted by himself and a few other colleagues. brony2893 singled himself out, attempting to stirrup trouble among the local miners. He spoke balefully about the Code, trotting out the same old lines about "extortion", right out of the gate. Clearly, brony2893 was a brony. I am not concerned about what people do in their private time, but when they mine in my territory, they need to conduct themselves in accordance with the rules. The next day, Father Julius followed-up to see if any progress had been made. brony2893 had reconsidered and became a "reluctant" supporter of mine. Confusion reigned. 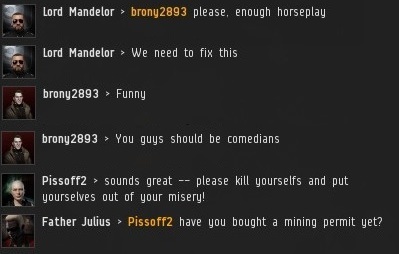 Someone had claimed to purchase a mining permit for brony2893, and brony repaid their kindness. But was it legit? When faced with a particularly difficult problem, GMs will escalate petitions. Agents, too, have the ability to call in the cavalry. After a careful study, Mandelor concluded that brony2893 was the victim of a "fake permit" scam. The locals were scandalized, but the New Order was on the case. Unfortunately, there are always those who will show disrespect to the local authorities, just for the sake of being a rebel. Pissoff2 came out of nowhere and took my name in vain. EVE players are taught not to file frivolous petitions, multiple petitions, or to take other actions which may increase the burden on the GM staff. 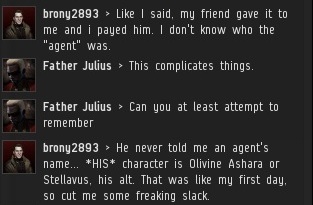 Likewise, highsec players shouldn't do anything to impede the work of my Agents. Regardless, the New Order always gets the job done, no matter how long it takes. Mandelor concluded his report to me: "...it seems that the miners here, especially those of Cutie Mark Crusaders Militant Coalition, still need serious education despite those who have begun to pay. I'll let you know if we manage to corral them into line." "You think we're on high horses, aren't you supposed to be a horse?" These horses are loose, and improperly broken. And that is not a proper James315 brand in his bio. He will have to be roped, broken, and branded. Or convrted into glue. Any of these tough little agents not in a carebear corp? If you don't fear them post with your main. Why? Other than Agent Trask, none of them do. Most of them are in New Order Logistics or some other corp. It doesnt matter, though, since most of them are -5 or worse. You can shoot them without a wardec if you want to, but that would require being ATK in a combat ship, and not AFK mining. I know New Order Logistics... I know there are a few others corps too. But since I am commenting on *this* article, I was referring to the "agents" in *this* article. Both in carebear corps. Both with sec status not near -5. So your MOST does not apply here. You can suicide gank them. Are you brave enough? "But since I am commenting on *this* article, I was referring to the "agents" in *this* article. Both in carebear corps. Both with sec status not near -5." I.e., you already knew the answer to your question, so you're an anonymous troll wasting everyone's time. How original. Audrik Villalona: At least you get it. 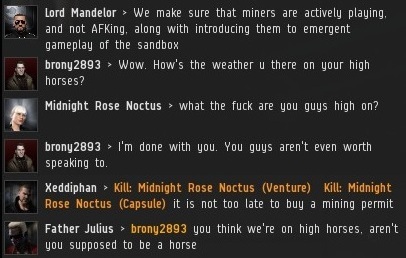 You would think that a group of people that spend a lot of their time screwing with miners and 'playing' this game would have a little bit of a sense of humor and not feed an obvious troll. Oh and I do love the people calling me (and others) out for commenting Anonymously - as they do the same. Is that Ironical? No it's 100% retarded. Audrik is essentially posting anonymously too. So am I. When people start making a point about posting anonymously like Audrik and Rennseslear often do, it's a culmination of frustration with their own lack of intelligence in making any sort of coherent argument. I imagine a light bulb pops up above their heads and they think to themselves: "I know, I'll say that any anon posters are irrelevant! That will mean I WIN!!!!" Most of us are in CODE. 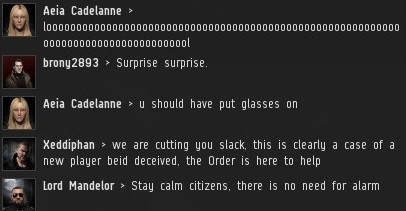 Once in a while a carebear wardecs us, and then realizes he is wasting his ISK since he can attack us in highsec at will without a wardec ... -10 flashy, eh? "Audrik is essentially posting anonymously too. So am I." I raised the point in the context of hiding from wardecs. In that context, I'm not posting anonymously, as you can wardec me from my name here. In another context, you'd be right, but that other context wouldn't be the correct one for this thread, which is about hiding from wardecs, not hiding from murderous internet stalkers--although you're well on your way to changing that. "it's a culmination of frustration with their own lack of intelligence in making any sort of coherent argument. I imagine a light bulb pops up above their heads and they think to themselves:"
Imagining thought bubbles with inane comments appearing over other people's heads is the kind of thing that happens to people when their culmination of frustration with their own lack of intelligence in making any sort of coherent argument finally overflows into childish daydreams. The next step is turning into a murderous internet stalker. > I'm not posting anonymously, as you can wardec me from my name here. Going by your sec status and lack of combat record, it's obvious that wardecking you would be pointless. All evidence points to you never having undocked. You appear to avoid all space flight and combat. You're worse than an AFK miner and a huge hypocrite. Either that or you are posting with an alt because you are a coward. However you slice it, you are sadly pathetic. > The next step is turning into a murderous internet stalker. Oh dear. You really are an idiot. making up such rubbish only serves to make you look more of an idiotic fool. The only rubbish here is your childish assumptions about other people's thoughts (I imagine a light bulb pops up above their heads and they think to themselves: "I know, I'll say that any anon posters are irrelevant! That will mean I WIN!!!!"). That part of your post was truly pathetic. When you reach 5 years of age you may be able understand the difference in meaning of those two words that you just equated as being equal and interchangeable. Until that day, probably better not to comment. Thanks for the tears as well, quite delicious. No Audrik, you never undock. You are a coward. 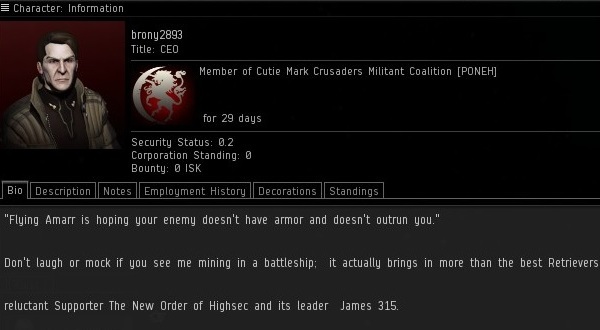 At least miners have the guts to undock! So you're saying I won EVE? That's really the best you can do? So, you're saying you "imagine" that they like to think they won the argument but you're not assuming at all that they actually think they won? Are you sharing with us complete fantasies based on nothing? Yeah, I agree that you better not comment anymore. 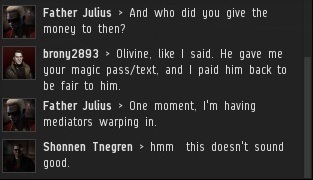 Audrik, it has been proven that by your own rules, you are actually worse than the miners you hate so much. It's not surprising that you believe you have won EVE, such is the extent of your delusion and idiocy. Which rules are those, specifically? thats a lovely npc corp youve been in for the last year bags. way to be the pot calling the kettle black! also, thanks for the following of my posts!! personally, id like to think that intelligence is visible from my posts, and being that i AM a man, i do like to know who i am talking to. posting under anonymous makes me feel like "whoever" made the comment doesnt want to actually own up to their opinion, something i am always proud to do. i rarely state that anoymous posts are irrelevant, only that trolls posting anoymously are just cowardly keyboard warriors. sometimes the ideas and thoughts are valid, and even succinct. 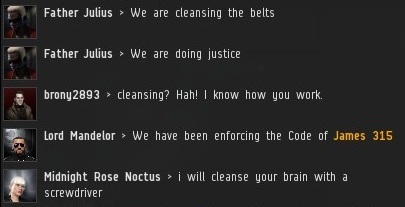 Always a pleasure making high-sec a better place. Sick to death of people saying things about Jehovah's Witnesses. They honestly have no idea about us. My impression is that Jehovah's Witnesses are the kind of people who will sicken even unto death upon hearing other people talk about them; yea verily, even the downtrodden voice of the ignorant and depraved will run rampant o'er their vigor. Would you agree that I have an idea about Jehovah's witnesses, or do you accuse me of being wholly without such an idea? I had a pair of JWs knock on my door a month or two ago. They proceeded to try to tell me that God made my car. I pointed out that it was Audi that made my car. They said I was wrong and that God made it. I pointed to the Audi logo and said "see, no God logo, just an Audi one". He said I had to look deeper. I told him I'm not about to open the hood and that it was time for my afternoon nap. I closed the door and they walked off. What I took from this is that JWs clearly aren't well versed in Car Manufacturer logos and believe that God has his own car brand that presumably is similar to a lot of Audis. Did I learn the wrong lesson anon May 7, 2013 at 6:03 AM ? JWs are required to shun family members who continually refuse to convert. Until they stop that, they stay on the "cult" list. Wait! I thought we were the cult??? Do we get our own ship brand now? Agent Trask, No they are not. I have plenty of family who are not Witnesses, but we associate all the time. The point is excessive association that will cultivate bad habits (smoking, drinking in excess, swearing). If someone has been disfellowshipped (ie they chose to leave), then we do not associate as they have chosen to shun us not the other way around. There is no cult stuff going on here. Got anything else to throw at me Trask? So then ... if a spouse of a Witness declares for atheism, you expect the Witness to shun their spouse, and try to prevent their children from associating with that person? Of course not. That would be absurd and completely wrong by Bible standards. I actually know people who's husbands/wives have decided to leave, and they still live together as a happily married couple as the person who didn't leave acts as a good husband/wife according to the bible. If the spouse who left starts to become heavily opposed (threatening violence and trying to stop them going to "church" or out preaching), then they will leave, but not until then. I know that they're one of the weirder, more fundamentalist sects of Christianity, and are not above shunning their own family members for transgressions that seem minor to an outsider. Refusing to convert being one of those transgressions. Anyone prepared to run their lives based on what an imaginary pixie in the sky tells them to do should really be shunned. Maybe I am more accepting, but I do not shun anyone for doing something wrong. We simply believe that by doing what is said in the Bible (New Testament not old) life would be better for everyone. That's all. And to smeee, no pixie tells me what to do, just good guidelines in a book. Just because you call it "disfellowshiped" does not change what it is. Changing the name from shunning to disfellowshipped, and putting the blame for this behavior on the victim does not make it any less cult behavior. You know what I'm just wasting my time here aren't I? I'm happy with my faith and really don't need to prove myself to you. The fact you think I'm obviously strange for being in this "cult" just shows that I shouldn't even try, but it was fun. Considering all of my family are happy, law abiding citizens who have stable jobs and enjoy life (and pretty much every other Witness I know is like that), I don't see why you would think negatively of us. The only thing I will mention is that I am Aussie, so things may be different in the US. But hey if you sat next to me at a bar (yes I go to bars) and we talked about Eve, you probably wouldn't know I was a member of this "cult." If I ever come to FanFest, and you happen to be there, I'll buy you a beer Trask. I promise I won't even talk about Jehovah... (I'll just preach about Chribba and the holy Veldspar instead). I didn't know what a "brony" was until I googled it. Sometimes, ignorance is bliss.